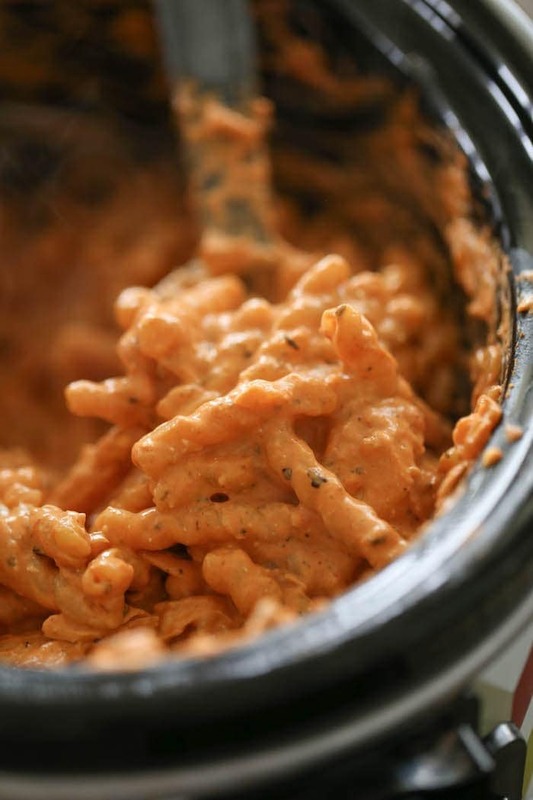 Crock Pot Recipes are the best, especially this Italian Chicken Pasta Recipe! Set it, forget it and enjoy! Add this into your dinner rotation. 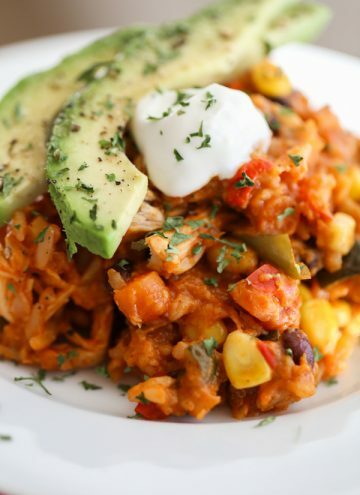 Crock Pot Recipes are my favorite, so simple and yet so delicious! This Crock Pot Italian Chicken Pasta is far from boring… Speaking of boring, exciting things are happening in the Brennan household! Gordon and I, since before we were married, have been working towards different and equally important goals. Well, maybe dreams would be a better term. Anyways, we are taking big steps this year so we can make our dreams a reality. And while I can’t tell you specifics right now, let this be your little PSA to go for it and reach your dreams too. We are so excited for the rest of 2017! And scared. But mostly excited!! And still a little scared. ANYWAYS–>let’s go back to talking about this recipe!! I’m not one to throw cream cheese into my dinners, let alone 1 1/2 blocks of cream cheese (yowza!) but I’m changing my ways. I’m just a professional recipe developer but whatever….don’t sound so surprised. This recipe starts with throwing nearly every single ingredient into a crockpot and cooking on high for 3-4 hours. Things like onions, garlic, chicken, cream cheese, marinara sauce, and some seasonings. Actually, those are all the ingredients you throw into your crockpot. 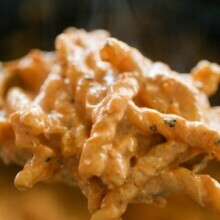 After it’s all cooked, you stir it together to shred the chicken and stir the melted cream cheese into the sauce. 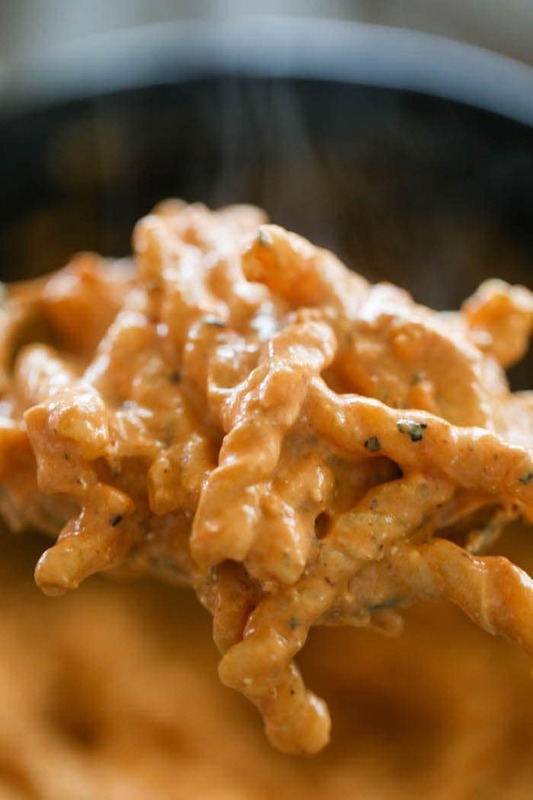 After a few minutes, everything will be pretty darn creamy and all you have to do is toss it together with some hot pasta. This will FILL a crockpot and feed a crowd unless your appetite is like Gordon’s. Or Eddie’s. Be sure to print out the recipe below and give this a try soon! It’s so so good and worth every calorie. *Lots of Italian Seasonings vary! Pick one you like, or use your own combination of basil, oregano and thyme. TyppicLly the Bay leaves are removed. Did you leave yours in? seriously you asked this????? seriously????? She seriously did Lana. She seriously did. Ho about just nicely answering the question? Most good recipes will indicate to remove the bay leaves before consuming. This looks like a good recipe and I am trying it out today. If people are concerned about it being watery – try adding some or all of the uncooked pasta. I am not doing that this round. I like to try recipes as written before dinking around with them and making them my own. Alright well I just wasted alot of money on my recipe because I crunched up my bay leaves and sprinkled them in little did I know bay leaves are supposed to be taken out I’ve never cooked with them I’m still learning. You didn’t state at all in your description to take out the bay leaves you just stated to add them and then later on you said mix everything so I had no idea and I crunched them up and sprinkled them in as peices can is till eat this ??? If not then yeah I wasted all that food and money……..
It’s common sense to not eat bay leaves, lol! What do you think about cutting the cream cheese in half? Why did you change your mind about adding cream cheese to anything? You could cut the amount of cream cheese in half, but you might have to also use less pasta because that is taking away from the amount of sauce there will be. I changed my mind about the cream cheese because I had a few blocks in my fridge that just weren’t getting used, so I decided to throw them into a few recipes and turns out CREAM CHEESE IS AMAZING. Can I cook on low for 8 hours while at work instead of on high for 3 to 4 hours? Does the crockpot get put on high or low for 4 hours? You add it in with everything else into the crockpot. I’d also like to add that the comment portion of this page is meant for people to ask questions and share ideas. If you want people to follow you and make your awesome recipes, I would consider changing your tone when responding to people and actually answer their questions. I have to say, your response about the bay leaf was unnecessary and childish. :/ . Made this last night. DELICIOUS!! 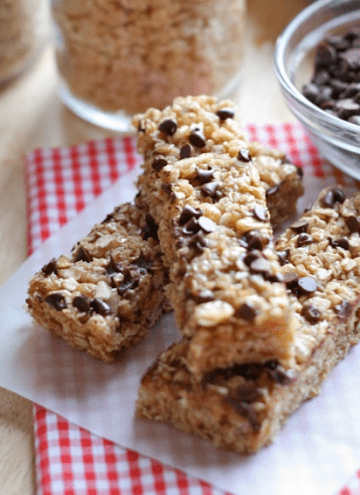 I’ll just add this to the long list of your other recipes we love! This was definitely kid approved–made me so happy!! (I did refer to it as “Ketchup Pasta” though.) 😉 Thank you!! Any tips for preventing the cream cheese from curdling? My cream cheese didn’t curdle…weird! Maybe don’t cook it as long? Mine does every time. I usually wait until the last 20 min of any recipe to add mine to prevent that. Could you use regular cheese instead of cream cheese? When it says chicken tenders do you mean like the frozen breaded kind of raw chicken ? Chicken tenders as in the fresh chicken tenderloins you can get right next to the boneless skinless chicken breasts. I have some that I cooked tonight. Any way to use them with this recipe even though the chicken is already cooked? You can use precooked chicken, just forgo the crock pot. Saute’ the onion and garlic add all other ingredients besides chicken and melt together in a saucepan. Shred and add your precooked chicken. (FYI – I shred all my cooked chicken in my kitchen aid with the paddle attachment. It’s way fast and easy.) Add the cooked pasta and mix it all together! So glad someone asked to clarify what “chicken tenders” were in the comments- I was confused too! Found them right next to chx breast as advised in your reply. I’m making it as we speak and super excited! What kind of noodles did you use? Those are different than any I’ve seen and would love to try them! it’s called Gemelli…found it at Costco! This was really good. My family really loved it. I have one that can be picky and she even liked it. I added 1/2 of a red bell pepper chopped with my onion and garlic mainly because we like it and it was super good. Thanks for the recipe. I misread the recipe….i added all the ingredients as instructed…INCLUDING the uncooked pasta! Did I just ruin my meal? I later noticed you add the cooked ingredients to the past later. I literally just started and am hoping everything will cook. Where can I find out the amount of calories this is? Lauren, this was fantastic! I added some peas, and was thinking broccoli might be good too. It’s going to be my new go to for meals to bring for others. Thanks! Do you cook on low for 3-4 hrs? Can I use raw chicken breast as “chicken, tenders” ? Yes, you’ll just have to cook the casserole 10-15 minutes longer if they are especially thick. I did everything as instructed but the recipe turned out bland and watery. Any suggestions to improve it? I don’t want to throw it away! What do I do to make it less watery ? What type of chicken tenders? Raw or coooked? I can’t wait to try this! Seems great for a busy week! I’ve made this recipe a couple times now and it’s always a hit with my family! I leave out the onion because of my picky eaters and usually use frozen chicken breast and cook on low until chicken is cooked through. It’s perfect everytime! 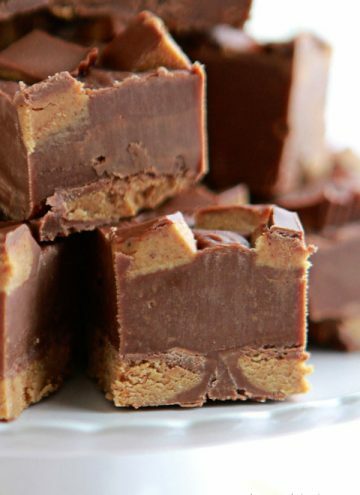 Someday…when I am having a cheat day, I am going to try this recipe, it looks amazing!! We tried this the other night! So yummy! I plan on trying this soon! I love coming home after a long day at work to the smell of food in the crock pot and no cooking when I get home ???? This looks amazing! I’m in need of some great crock pot meals!! I made this for a friend who just had her 4th baby. They loved it! Made this for the family a few weekends ago and they loved it. Easy and delicious! This looks amazing. My kids love pasta and I love a crock pot dinner! Everyone wins. Went to the store today to buy ingredients for this! Can’t wait to try. THANK You! I am always looking for new crockpot dishes and this one looks delicious! Can’t wait to try it! I have made this several times now and my family loves it! 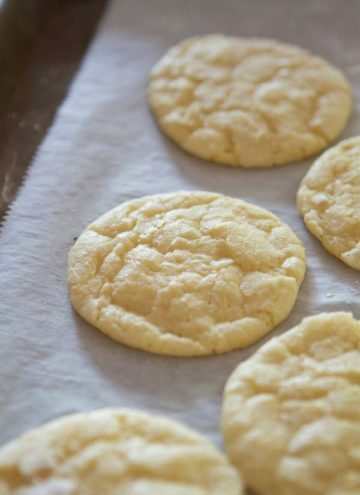 So delicious for being so simple and using ingredients I always have on hand. 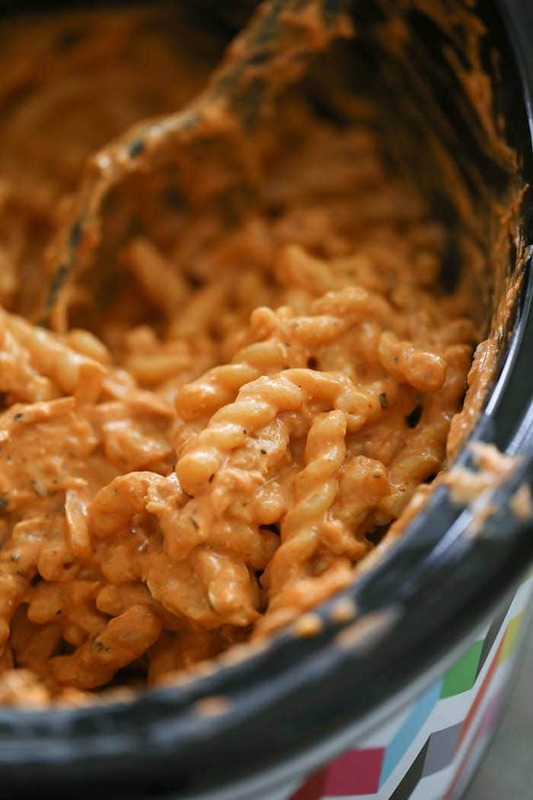 Cream cheese in pasta dishes = huge win! Thanks Lauren! Tried this and it was delicious. Thanks. Bookmarked this recipe to try. I’ve yet to make one of your dishes that wasn’t absolutely delicious! Cook on HIGH for 3-4 hours. It’s mentioned in the post above, but not the recipe. Hope this helps. What is the calories per serving for this? Thanks for the awesome dish! No! Cream Cheese changes texture after its been frozen and then thawed and not in a good way! Can i use difference pasta? Trying this now seen recipe, yum loved reviewss. Making this right now… I can’t wait to see how it tastes!!! Update later!